a commentary on the Bhāgavad Gītā; etc. In the south of India many great devotees have appeared to spread the glories of the Lord. Of all these devotees, perhaps the most famous is Śrī Rāmānujācārya, the great teacher of Śrī Vaiṣṇavism who celebrates 1000 years this year. However, just before Rāmānuja there lived another great Vaishnava whose life and teachings had a tremendous influence on Rāmānuja, although in fact the two of them never met. This was Śrī Yamunacharya, also known as Ālavandār - "The Conqueror." It is appropriate in considering the life of Rāmānujācārya that we should first look briefly at this great soul, the illustrious writer of the famous Stotra-ratna. Yamunacharya was born around AD 918 in the city of Madurai in south India, which was then the capital of the mighty Pāndya kings. His grandfather was a well-known scholar and devotee known as Nāthamuni, who was also famous for his mystic abilities and expertise in the practice of Aṣṭāṅga yoga. It was Nāthamuni who first compiled the songs of Nammāḷvār, a famous south Indian devotee, and had them set to music. Nāthamuni’s son was a handsome, intelligent young man named Īśvaramuni, who married a beautiful young wife. Shortly after the wedding, Īśvaramuni travelled with his wife and parents to visit the holy places of pilgrimage in northern India, including Vṛndāvana, the birthplace of Lord Kṛṣṇa. Just a few months after their return from this pilgrimage, Īśvaramuni’s wife gave birth to a baby boy, and, in memory of the sacred river which flows through Vṛndāvana, Nāthamuni named him Yamuna. However, the joy of the young couple was but short-lived, for just a few years after the birth of the child Īśvaramuni passed from this world, leaving his young wife a widow. Nāthamuni was so distressed by the untimely death of his son that he decided to have no more to do with the affairs of this world. He left his wife and relatives to take up the life of a renounced sannyāsi, totally dedicating himself to the worship of Lord Viṣṇu. Thus at a very young age Yamunacharya was left to be brought up by his mother and aged grandmother, living a life of great poverty. When he was five years old, Yamunacharya went to study at the school of Bhāṣyācārya and quickly won his teacher's affection, both for his sweet nature and his ability to learn quickly. He studied hard, and by the time he was 12 years old he was Bhāṣyācārya's best student. In those days in India, great scholars used to challenge one another to see who was the more learned in Vedic scriptures and more skilled in the science of logic. While Yamunacharya was studying at the school of Bhāṣyācārya, there was a great scholar who lived at the court of the Pāndya king. His name was Akki Alwan, and he was a great favourite of the king because he could defeat any other scholar in a debate. In fact, the king had passed a law decreeing that every scholar who had been defeated by Akki Alwan must pay a tax to him every year - if anyone refused he would be put to death. Now Yamunacharya's teacher, Bhāṣyācārya, had also been defeated by Akki Alwan, and so he too was obliged to pay this tax. However, because he was a very poor man, he had not been able to pay for the past two years. One day, when Bhāṣyācārya was away on business and all the other students had gone home, Yamunacharya was left alone in the school. At that time one of Akki Alwan's disciples came there to collect the overdue tax from Bhāṣyācārya. "Where is your teacher?" he demanded in imperious tones when he saw that Yamunacharya was alone in the school. "May I know, sir, who has sent you here?" replied Yamunacharya in a very gentle voice, anxious not to give any offense. "What!" exclaimed the disciple, "do you not know that I am a disciple of the greatest and most erudite scholar in all of India? Akki Alwan is the terror of all other scholars, and even the great Pāndya king is his obedient servant. All those scholars defeated by the great Akki Alwan must pay a yearly tax or else forfeit their lives. Has your teacher become insane that he dares to withhold payment for two years? Or is it that he intends to challenge my master again, just as a moth rushes into a blazing fire." Yamunacharya was by nature very kind-hearted, and he hardly ever quarrelled with his fellow students. However, he also had great love and respect for his teacher. "How foolish you are and how foolish your teacher is as well, for who but the greatest fool would train his disciple to possess such monumental pride, instead of removing such qualities from his heart. Why should my noble teacher waste his time debating with such a man? Go and tell your master that the lowest disciple of the great Bhāṣyācārya challenges him to a debate. If he dares to face me, let him send his reply at once." Akki Alwan's disciple was so astonished and indignant that he could not think of anything to say, but left in a furious rage to inform his teacher of this insult. When Akki Alwan heard what had happened, he could not help but laugh on hearing the age of his rival. The Pāndya king decided to send another messenger to the boy to see whether he was insane, and, if he was serious about the debate, to bring him immediately. "I will certainly obey the command of his majesty the king; but if I am to be accepted as a proper opponent of the great Akki Alwan, then surely a conveyance should be sent to bring me to the palace"
After discussing Yamunacharya's reply, the king and his courtiers agreed that the boy's statement was fitting and sent a costly palanquin and one-hundred soldiers to conduct him to the palace. In the meantime news of these events had spread all over the city of Madurai, and Bhāṣyācārya heard the whole story as he was returning home. He was very unhappy to learn of the danger his favourite student was facing, for though the king was generous by nature, it was well known that he dealt very severely with anyone who insulted the court paṇḍita. "There is no reason, revered sir, for you to be alarmed," he consoled his teacher when he returned to the school, "for you can be certain that, by your grace, I will smash the pride of Akki Alwan." While they were thus talking, the king's men arrived at the school with the palanquin. Yamunacharya worshipped the feet of his guru and calmly climbed into the palanquin, preparing himself for the great debate that was about to take place. A large crowd of people had gathered along the way, for it was unheard of that a twelve-year-old boy should challenge the court paṇḍita and everyone wanted to catch a glimpse of the wonderful child. The brāhmaṇas, many of whom had already been defeated by Akki Alwan, offered him blessings, saying, "May you defeat this insolent paṇḍita, just as Viṣṇu in the form of a dwarf brāhmaṇa displaced Bali Maharaja, the king of the asuras." Meanwhile, in the royal court a difference of opinion arose between the king and queen about Yamunacharya. The king said, "Just as a cat plays with a mouse, so will Akki Alwan defeat and destroy the boy". But the queen was more thoughtful, realizing that Yamunacharya was no ordinary child. "Just as a small spark," she said, "can turn a mountain of cloth to ashes, so will this boy destroy the mountain-like pride of Akki Alwan." "How can you really believe that this is possible?" exclaimed the king in amazement. "If you truly have faith in the child, then you must make a wager to back your words". "Very well," replied the queen, "I will make a wager. If the boy does not defeat and humble the proud Akki Alwan, I will become the servant of your maidservant." "This is certainly a mighty wager," said the king, "but I will match it. If the boy defeats Akki Alwan, as you say, then I will give him half of my kingdom." While the king and queen were thus exchanging wagers, the palanquin arrived and Yamunacharya entered the palace. When Akki Alwan saw him, he looked at the queen and smiled sarcastically. "Ālavandār," he said, meaning, "Is this the boy who will conquer me?" "Yes," replied the queen quietly, "Ālavandār. This is he who has come to conquer you." When the contestants were seated, Akki Alwan began the debate by putting simple questions on Sanskrit grammar to Yamunacharya. When, however, he found the boy could answer them with ease, he began to pose really difficult grammatical problems; but still, Yamunacharya replied to them all without difficulty. Remember that Aṣṭāvakra was no older than myself when he defeated Bandi at the court of King Janaka. If you judge a person's learning by his size, then surely it follows that the water buffalo will be a greater scholar than yourself." Although Akki Alwan winced at these words, he controlled his anger and replied smilingly, "Well answered. Now it is your turn to put questions to me". "Very well," Yamunacharya responded, "I will put 3 propositions before you, and, if you can refute them, I shall accept defeat." Akki Alwan agreed and prepared to refute Yamunacharya's statements. "My first proposition is this," Yamunacharya spoke out clearly and boldly, "that your mother is not a barren woman. Refute this if you can." Hearing this, Akki Alwan remained silent. "Had my mother been barren, my birth would not have been possible," he thought. "How can I refute his statement"
Seeing Akki Alwan as silent as a dumb man, all the courtiers were astonished. Although the great paṇḍita tried to conceal his anxiety, he could not prevent a flush from crossing his cheeks. "Sir, if in spite of your all-conquering intelligence you are unable to refute my first proposition, then please hear my second. It is this, that the Pāndya king is supremely righteous. Refute this if you can." On hearing this Akki Alwan, was deeply disturbed, sensing his imminent defeat. With the king seated there in front of him, how could he deny the boy's statement? Again he remained silent, the colour draining from his face as he was scarcely able to control his anger. "Here is my third proposition-that the queen of the Pāndya king is as chaste and faithful to her husband as was Sāvitrī. Refute this if you can." "You rascal," he screamed, "how can any loyal subject say that his king is unrighteous or his queen unfaithful to her husband? First you must refute your own propositions, and, if you cannot, you should be put to death, for the implications of your words are treason against your king and queen." "No, Akki Alwan is defeated. He is simply letting forth his anger, because he could not refute the statements of Yamunacharya as he promised to do." Thus an argument broke out in the palace, but in the midst of the contention Yamunacharya quieted them all by saying, "Please stop this argument, for it is unnecessary. I shall refute all my propositions one by one. Please hear me"
At this everyone fell silent and turned their attention to Yamunacharya, wondering how he could possibly do this and yet not offend the king and queen. "My first statement," he continued, "was that our great Paṇḍita’s mother was not a barren woman. However, it is stated in the Manu Saṁhitā that a woman who has only one child is to be considered barren. As your mother gave birth to only one son, even though he is a man of such merit as yourself, according to the śāstra, she must be considered barren. Secondly, I stated that the king of the Pāndyas is a most righteous man. However, the Manu Saṁhitā states that a king enjoys the benefit of one sixth of the religious acts of his subjects, but also has to bear the burden of one sixth of their sinful deeds. Because in the present age of Kali men are more prone toward sinfulness than piety, it must follow that our king, although flawless in his own character, is bearing a heavy burden of unrighteousness. And now to my third proposition, which stated that our queen is as chaste and faithful as was Sāvitrī. But again, if we consult the laws of Manu, it is said that the king is the representative of Agni, Vāyu, Sūrya, Candra, Yama, Kubera, Varuṇa, and Indra. Therefore, the queen is married not just to one man, but to these eight demigods as well. So how can it be said that she is chaste?" On hearing these wonderful answers, all the people were filled with amazement and the queen joyfully cried out, "Ālavandār! Ālavandār! - He has conquered! He has conquered!" "Just as on the rising of the sun," he said, "all the insignificant stars fade away, so you, O learned Yamunacharya, have conquered the proud Akki Alwan by your learning and skill. This fellow just a short while ago was demanding your death, now you may deal with him as you see fit. I have also promised to give you half my kingdom as a prize for this victory, and that promise I will certainly fulfil." Of course, Yamunacharya forgave Akki Alwan, and, although he was but a boy of twelve years, he began at once to rule the kingdom he had won. Thus his days of poverty were over. When Yamunacharya became the ruler of half the kingdom of the Pāndyas, some of the neighbouring kings saw this as a fine opportunity to invade and plunder his lands. When he learned of this from his spies, the boy king marched against them with a strong army before they were prepared, and they were all forced to surrender to him. In this way he enlarged his domain and began to rule the kingdom. Unfortunately, although he was a shrewd and righteous monarch, he became distracted from his spiritual understanding by political dealings and the sense pleasures that go along with a high position. He forgot that this life is but a temporary stage in our eternal existence and gradually gave up his acts of devotion to Lord Viṣṇu. Meanwhile, Nāthamuni, Yamunacharya's grand-father, passed from this world to return to the lotus feet of the Lord. He had always loved Yamunacharya very dearly, and he was filled with sorrow to hear how his grandson had abandoned the path of devotion for the sake of enjoying sensual pleasures. "My dear grandson, Yamuna, who is known as Yamunacharya, has forgotten the greatness and glory of Lord Viṣṇu, being attracted by the temporary pleasures of this material world. Now I am preparing to give up my life, and I can do nothing more to deliver him. Therefore my last request to you is that you save my grandson from the darkness of nescience in which he is now sunk. I leave him to your care." Rāmamiśra, being a dutiful disciple, never forgot this last instruction of his guru-maharaja. Therefore, several years later when Yamunacharya was thirty-five years old, he went to his palace seeking an interview. However, when he arrived there, he saw that the gateway to the palace was crowded with the chariots and soldiers of different kings. Even powerful noblemen had to wait for a long time before they were able to gain an audience with the mighty Yamunacharya. As a poor sannyāsī beggar, Rāmamiśra realized that there was little chance of his ever getting to see Yamunacharya and that he would have to think of a plan by which to accomplish his mission. There is a certain type of spinach, known as tuduvalai, that grows in South India. This tuduvalai is famous for developing the qualities of goodness in a man, making his mind peaceful and serene. Rāmamiśra found some of these plants growing near the palace. Collecting the green leaves, he brought them to the chief cook in the royal kitchen. "May Lord Nārāyaṇa bless you! I beg you to please serve these tuduvalai leaves to the king every day, for it is well known that he is a pious man. By eating this herb he will be able to develop his qualities of goodness and also increase the duration of his life. Every day I will bring some here to you." As it happened the cook was a pious man who knew the value of the tuduvalai plant and he happily agreed to Rāmamiśra's proposal. Thus, every day for two months Rāmamiśra brought the green leaves of the tuduvalai plant to the royal kitchen, and every day they were served to Yamunacharya, who very much appreciated them. When Rāmamiśra heard this, he deliberately stayed away one day; when the king found that the tuduvalai preparation was absent from his plate, he called for the cook. "Why did you not cook that spinach preparation for me today?" he asked. "Your majesty," the cook replied, "the sadhu who usually brings the spinach did not come today." "Who is this sadhu and what price does he ask for his service?" asked Yamunacharya. "My Lord," replied the cook, "I do not know the name or dwelling place of that sadhu. He will accept no payment at all for his service and renders it only out of love and regard for your majesty." On hearing this Ālavandār told the cook, "If this man comes again, show him due respect and bring him to me." The next day Rāmamiśra again brought tuduvalai leaves to the kitchen door, and the cook at once brought him to Yamunacharya. "Holy sage, I am your servant. Please accept my obeisances at your feet. I have heard that every day you gather and bring tuduvalai for me and will accept no payment for this service. Is there anything that I can do for you?" "Some years back your grandfather, the renowned Nāthamuni, left this world and returned to Vaikuṇṭha. Before he departed, however, he left in my care a great treasure to be given to you at the right time. Now I am asking you to accept this treasure." Yamunacharya was very pleased to hear these words, for at that time he was preparing a campaign against a rebellious king and was in great need of money. "Sir, you are certainly a most saintly person, being so renounced that you have not kept this treasure for yourself. Now please tell me where it is to be found." "If you follow me I will take you there. It is kept within seven walls, between two rivers, guarded by a great serpent. Every twelve years a demon from the south goes to inspect the treasure, which is guarded by mantra. Through the power of mantra the treasure will be revealed to you." 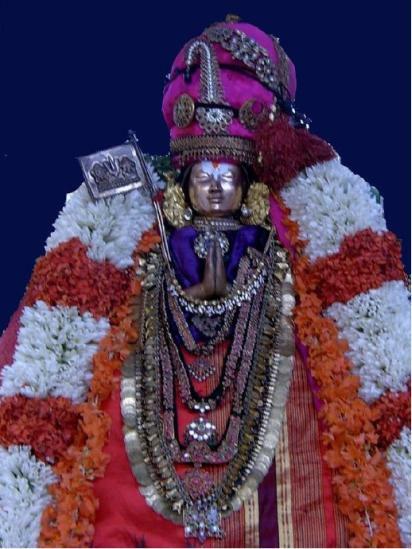 In fact the treasure that Rāmamiśra was describing was the beauty of Lord Raṅganātha, the Deity who resides within a seven-walled temple on an island in the Kāverī River. The serpent is the bed of Ananta-Śeṣa, on whom the Lord is reclining. It is said that this Deity was first installed by Vibhīṣaṇa, the brother of Rāvaṇa, and that every twelve years he goes to Rangaksetra to worship the Lord. The powerful mantra is the holy name of the Lord, for by chanting the holy name one is able to gain the transcendental vision by which one can appreciate that the Deity is non-different from the Lord Himself. However, Ālavandār could not understand the real meaning of Rāmamiśra's words, and, being anxious to acquire the treasure, he said, "I am ready to go there immediately along with four divisions of my army. Please be our guide"
"It is better if we go alone," replied Rāmamiśra, "for it is not advisable for many people to assemble there." The king accepted this proposal, and, having made arrangements for the management of the kingdom in his absence, he prepared to set out with the sadhu. Leaving the city of Madurai behind them, they travelled in a northerly direction. At noon, while they were resting from the heat of the sun, Rāmamiśra began to chant the verses of the Bhāgavad Gītā. It was many years since Yamunacharya had read and studied this great scripture, and while he had ruled as a king the sublime teachings of the Gītā had been far from his heart. But now, as he listened to Rāmamiśra's sweet voice bringing forth the words of Śrī Kṛṣṇa, he began to realize the illusory nature of his position as a king and to see how he was neglecting the real goal of life. "Please accept me as your servant, so that I may be able to continually relish the sweet nectar of Śrī Kṛṣṇa’s words. Now, as I hear from you, all the pleasures of my worldly life seem pale and insignificant." At this Rāmamiśra smiled and said, "If you have the time to spare, then why not stay here for a few days and study the Gītā with me." "Whatever duties I may have in this world," he replied, "certainly the most important duty for every man is to understand the true meaning of the Bhāgavad Gītā." Thus, the two of them remained in that solitary place for almost a week, and every day Rāmamiśra spoke on the sublime teachings of the Gītā, while Yamunacharya listened with rapt attention. With every word that the sadhu spoke, the king's attachment for his material opulence was diminished. This is natural, for once one becomes truly aware of the glory and sweetness of the Supreme Lord, Śrī Kṛṣṇa, the pleasures of this world seem worthless in comparison. "Alas! Alas! All these years I have wasted my life, with my mind and intelligence absorbed only in thoughts of lust and wealth. When will that day come when I will be able to remove such useless things from my heart and fix my mind completely on the lotus feet of Śrī Kṛṣṇa?" "Your majesty, your pure mind rests always on the lotus feet of the Lord. Just for a short time it has been captivated by worldly desires, as a small cloud obscures the sun's rays for a short time. Now that cloud has almost gone, and the sun will shine again and dispel the darkness from your heart." At this point Yamunacharya decided that he wanted no more to do with material life, and so he told Rāmamiśra, "Now, all I desire is to become your disciple, and so I have no need of the wealth left by my grandfather." "But I gave my word to Śrī Nāthamuni," replied Rāmamiśra, "and so I must deliver the treasure to you to keep my vow intact. Now let us continue our journey together." After walking for four days, they reached the banks of the Kāverī River and the next day crossed over to the island on which stands the sacred temple of Śrī Raṅganātha. "In front of us lying on the bed of Ananta-Śeṣa is the treasure that was your grandfather's only property - Śrī Raṅganātha, the Lord of Lakṣmī Devī, the most beautiful of all Deities." Hearing these words, Yamunacharya ran forward and fell unconscious at the feet of the Deity. From that day he had no desire to resume his royal position. He took initiation from Rāmamiśra and spent the rest of his days totally absorbed in service to Śrī Raṅganātha. Part of his kingdom was returned to the Pāndya kings, and a part of it he gave for the service of Lord Raṅganātha. He received from his guru the mantra of eight syllables - Om Namo Nārāyaṇāya and by chanting this mantra he attained the topmost platform of loving devotion to the Lord. On the order of Rāmamiśra he learned the art of mystic yoga and meditation from Śrī Kurakanatha, who had been instructed in that science by Nāthamuni himself. After the disappearance of his guru, Yamunacharya was accepted as the head of the Vaishnava community. Whilst he was the ācārya at Śrī Rangam, he wrote four books of Vaishnava philosophy, as well as many prayers in glorification of the Supreme Lord. In particular he was devoted to the writings of his ancestor Nammāḷvār, which he recited constantly and taught to all of his disciples. Eventually the king of the Cholas and his queen were also converted, and they dedicated themselves to the worship of Lord Viṣṇu. All the devotees in south India adored Yamunacharya for his renunciation, learning, humility, and steadfast devotion. The story of Śrī Rāmānuja, the famous propounder of Viśiṣṭādvaita philosophy and Bhāgavata tradition you can read HERE .